Auto body technicians use special machines to restore damaged metal frames and body sections to their original shape and location. The technicians remove badly damaged sections of body panels with a pneumatic metal cutting gun or acetylene torch and weld in new sections to replace them. Technicians also repair and replace the plastic body parts used on newer model vehicles. They remove the damage panels and determine the type of plastic from which they are made, and replace plastic parts which are badly damaged or more difficult to repair. In large shops, technicians may specialize in one type of repair. Certification by the National Institute for Automotive Service Excellence (ASE), which is voluntary, is recognized as a standard of achievement for auto body technicians. To be certified, a technician must pass a written examination and must have at least two years of experience in the trade (two years of school count as one year of experience). To retain certification, technicians must retake tests at least every five years. 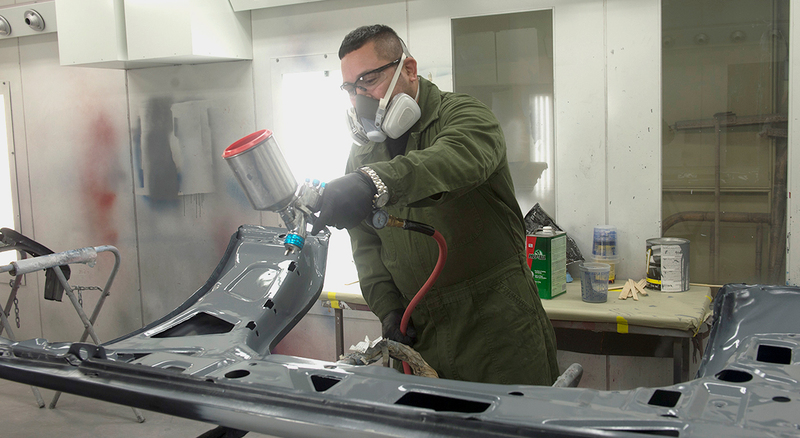 Continuing education throughout a career in auto body repair is becoming increasingly important. Automotive parts, body materials, and electronics continue to change and become more complex as technology advances. Gaining new skills, reading technical manuals, and attending seminars and classes is important for keeping up with these technological advances. Specialized courses for the Auto Body Applied Technology Certificates include the basics of the automobile, basic electricity, air conditioning, suspension rebuilding, total wheel alignment, metal and paint principles, paint blending, minor metal and spot repair, major and advanced paint techniques, major collision and frame repair, estimating, welding, business practice, communications, and computations.